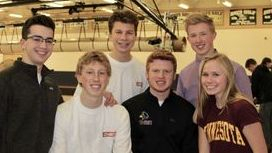 Ryan founded the Chaska Basketball Report, and proceeded to create the Chaska Hawks Broadcast Network. Ryan now oversees all operations of CHBN for Basketball and Hockey. Ryan does Play-by-Play for Hawks Basketball and a senior at Chaska HS. Greg has been around Chaska hockey for years as the arena PA announcer. In 2017, he joined the CHBN team as an analyst for certain hockey games. Eric is the sports editor at the Chaska Herald and other SW Metro Newspapers. Eric covers 5 schools in the area, and joins the broadcast crew for color commentary and analysis when he can. Colin began with CHBN in 2016 as a hockey commentator. A 2018 graduate of Chaska HS, Colin now attends the University of Minnesota and returns to call games as he is able. Max now in his second year of service at CHBN is the lead producer for basketball games. Max is also a contributor to CHBN Images. Max is currently a senior at Chaska High School. Danny is in his second year with CHBN and is behind the camera for basketball games, primarily the road games. Danny currently attends the University of St. Thomas as a freshman. Landon is in his first year with CHBN and currently spending his time as a CHBN Productions video producer. Landon is currently a junior at Chaska High School. Nolan's second year with CHBN is behind the computer doing production at basketball events. Nolan is currently a senior at Chaska High School. Alec is in his first season with CHBN and will be the camera operator for most basketball games. Alec is currently a senior at Chaska High School. Andrew is in his first season with CHBN and handles both production and camera duties for basketball and hockey. Andrew is currently a senior at Chaska High School. Dylan started with CHBN in winter 2018 and is a camera operator for Chaska Hawks hockey games. Dylan is currently a senior at Chaska High School. 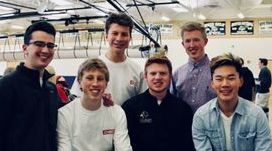 Jack came on at CHBN in 2017 and began as a producer for basketball games. Jack also handles stats for select broadcasts. Jack is a freshman at the University of Minnesota. Justin is a camera operator for CHBN basketball. He is also a three-sport varsity captain for Hockey, Baseball, and Football. Justin is currently a senior at Chaska High School. Bryce is on the JV hockey team at Chaska. He is in his first year as a camera operator for the varsity hockey games. Bryce is currently a sophomore at Chaska H.S.